"It's a bomb, it's definitely a bomb." This is the type of footage that would show the orb but we don't get that here. The impact was edited out by someone, that's for sure. It's the girl that says a lot here, but some of it is difficult to hear. She saw something, but it definitely wasn't a big plane. She was confused as to what she saw and how the tower exploded. A blue sky and the haze. Three flight paths with cgi and the ball.. The wide angle never dives but flies straight south to north. There were three distinct cgi paths and the correct path of the ball floating slowly from the west. 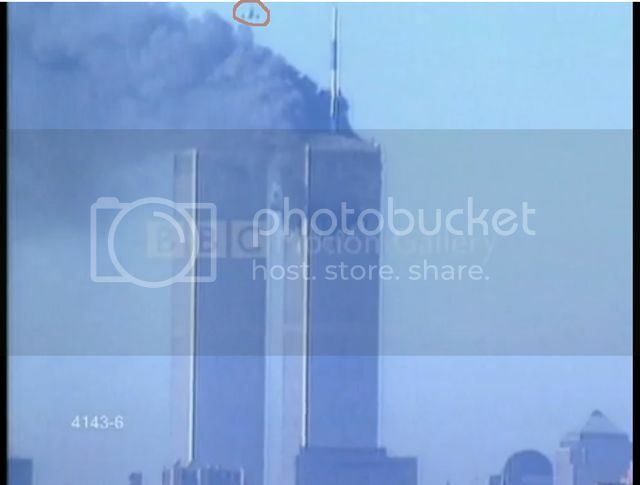 The official flight myth had fake 175 descending from above the smoke and behind the towers. This is Flight 175's descent. A passenger jet cannot drop in altitude this fast and still stay in control. It hits the south tower at a height of around 1000 feet at 9:02:40 which means the flight descended over 8000 feet in 40 seconds. The last 52 - 60 miles of fake 175's journey was covered in 4 mins 40 seconds. This places speed between 668 Mph and 771 Mph Maximum cruising speed for Boeing 767 is 568 MPH and that is at cruising altitude. The plane would go much lower speeds at lower altitudes. This flight data is in the NTSB report. A lot of sources say flight 175 hit the south tower at 590 MPH, even NIST says 540 MPH. These speeds are not attainable at lower altitudes. A plane flying at these speeds would be out of control.